I love teaching, specifically teaching flute privately. I love it so much that I rarely turn down a family’s inquiry, unless I am too overbooked even to consider taking on another student. I work as a freelance teacher, performer and adjunct professor in Nashville, TN, where people like me are very fortunate—we can submit ourselves to the same fingerprinting/background check practices certified teachers go through and then teach students at school during the school day. Nashville is also a fast-growing urban sprawl, with more new schools opening each year. Add all of these variables up, and the situation can quickly get out of control. By the end of the spring 2017 semester, I had 58 students! Deep in the heart of the term, it can be a challenge for me to keep my motivation going day after day, between dealing with traffic and parking, the check-in procedure at each school, altered schedules and unanticipated absences. I get a lot of fulfillment out of my teaching, but I do worry that I’m not giving individualized enough advice sometimes, and I think that’s also a pretty normal fear for teachers. 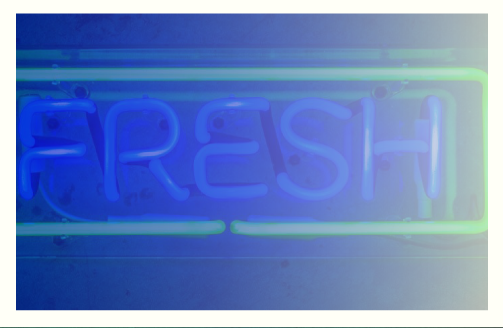 Here are a few ways I cope with those fears and keep things fresh, lesson after lesson, week after week. 1) Strike a balance between materials that everyone will study and individual choices for each student. In the Fall, my middle and high school students work on honor band tryout music, scales and sight-reading almost exclusively. For the students who can handle more, we add etudes, and we play duets when there’s time. But in the Spring, I like to choose one technical book for everyone to use (Reichert, Taffanel and Gaubert, Maquarre and DeLaney’s Daily Dozen are favorites.) I keep an informal cycle with the idea in mind that I’d like students to cover a certain amount and variety of material before they graduate high school, but I try not to repeat within one student’s high school experience. For their solo repertoire, however, I really dig deep to try and match students with pieces that will enhance specific skills and push them in specific ways—and hopefully allow them to develop and enjoy the beauty of their own music-making while we’re at it! 2) Remember that not every student is in every lesson. Sometimes I feel like a broken record, as if I am repeating the same information to every student all week long. The truth is that situations I find in one student often do crossover to the needs of other students, but I do also find inspiration moment to moment. And sometimes, they simply all need work on the same things! It’s important to me to feel connected to each student as an individual person and to feel that I am meeting their individual needs. But having everyone work on double tonguing doesn’t necessarily mean that I’m not also connecting and meeting those needs. I may hear myself explain the same thing the same way six or seven times a day in six or seven lessons, but each student is only hearing that information once. 3) Be an engaged listener. This may seem contradictory, considering point #2, but I believe that it is vitally important to listen with an engaged and analytical mind when students play. Listen for the disease rather than the symptoms. Working on repertoire and etudes will often expose other, deeper issues in a student’s fundamental skill set, but for all but the most obvious problems, teachers must think (and listen) outside the box. Every once in a while, I will catch myself letting something go in favor of not starting something we can’t finish in that session, or because I am tired and the idea of opening that particular can of worms is exhausting in itself. I fight hard to keep from letting things go, because even five minutes is enough to start something that is fundamentally important to music making. 4) Make yourself turn off and retreat. For our own mental health and to avoid burnout, it is vital that teachers learn to say no and to enforce rules about personal time and space. I think that it is terribly difficult to do this and I fail at it repeatedly, but refusing to answer texts, calls or emails in the evening or on the weekends is a completely acceptable thing to do. I take two weeks of vacation each year in May by simply putting my foot down and refusing to book lessons until the beginning of June. I do not teach when the schools are out for Christmas Break, and I do my best not to teach for more than ten hours a day. When I’m tired, everyone gets less quality from me—less patience, less care, less engagement all around. I’m learning to keep a waiting list and pass potential students on to other area teachers rather than hoarding them and driving myself crazy. There will always be more, in an urban area. 5) Indulge your inner performer. I still play, as often as I can. I’m a member of a part-time orchestra and a local Baroque ensemble. Feeding the part of me that loves performing makes me a better teacher, because I am more fulfilled as a person. When I’m happier, I am more generous with my energy and ideas, which in turn again makes me feel happier with myself as a teacher. I also serve on the board of my regional flute society and work with my Baroque group in an administrative capacity. Being around my peers feeds and renews my sense of community and purpose, and it helps me to keep everything in perspective. Having other flutists and teachers to talk to means a lot! This idea spills over into other pursuits, too. One of the great joys of my year is keeping a spring and summer vegetable garden, and I look forward to it through the cold months. I’ve also tried my hand at making silver jewelry, playing Irish traditional music, writing fiction and preserving and canning—making myself learn something new makes me a better teacher and a better human being. It’s a virtuous circle, rather than a vicious one! 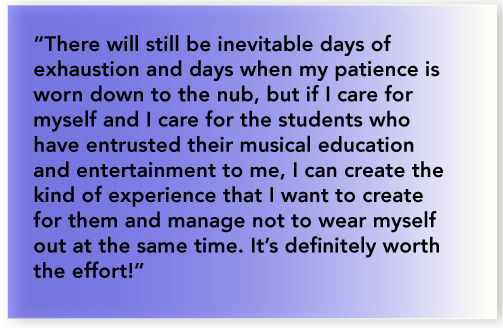 There will still be inevitable days of exhaustion and days when my patience is worn down to the nub, but if I care for myself and I care for the students who have entrusted their musical education and entertainment to me, I can create the kind of experience that I want to create for them and manage not to wear myself out at the same time. It’s definitely worth the effort!